This week, we are spotlighting a Best Women’s Travel Writing 2010 contributor who is American by birth and global by inclination, dividing her time between Melbourne and Bali: Liz Sinclair. 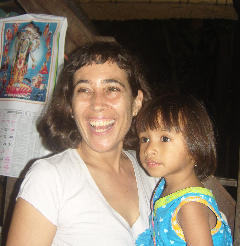 A freelance travel writer who volunteers as a grant writer for a maternal health foundation for poor families in Indonesia, Liz also keeps a blog, Raising Ellyanna, that documents her unexpected foray into motherhood with her Indonesian foster daughter. Visit her website at www.lizsinclair.com. What is home for you? Is it a particular place or person or thing? Home is Melbourne, Australia, even though I was born and raised in America, and even though I spend most of my time in Bali these days because of my Indonesian foster daughter. Melbourne is the place I wish I’d grown up. I think it is the coolest city on the planet, with its diversity of people, cultures, and cuisine, and I never get tired of being there. As soon as Ellyanna is a teenager, I want to take her to live there and introduce her to my beloved city of migrants. I started traveling at nine, when my parents, being very forward thinking and liberal, allowed me to travel by myself to Germany to spend the summer with relatives. (Not entirely by myself: my parents put me on the plane, the airline crew watched over me, and my cousins met me at the other end.) I discovered, even at that young age, that traveling solo was a great way to reinvent oneself. I missed my connecting flight on the way back, causing my parents great anxiety, but in the end, they recovered and allowed me to return to Europe by myself when I was 13. I won a Lonely Planet Travel Writing Contest while living in London, and my story ran in the Evening Standard. I didn’t get the letter in time, alas, so was never able to see my story in print. However, a few weeks later, a box of books arrived in the post, containing the complete Lonely Planet series of travel writing books, which only fueled my interest in becoming a travel writer. The one where I was grabbed by a Chinese taxi driver at a cab depot in Canton, who was trying to get extra money from me, thinking I was just a helpless woman and he could push me around. He didn’t realize that I study martial arts, and I broke his jaw. (In all the years of traveling, it’s only the second time I’ve had to hit someone because I felt seriously threatened.) Martial artists have near-mythic status in China and my action earned me the fastest ride in history, in a second taxi, through the streets of Canton to the dock where my boat was waiting. Herodotus. I’d love to travel with him as he retraced the routes of his original journeys, and see his reaction as he witnessed how much the places and people he wrote about have changed. I love his musing, ration, almost scientific (for the day) style of writing. Machu Picchu. Seeing this historic site in real life was simply an awesome experience, and everyone I’ve spoken to who’s been there feels the same way. YouTube is great for planning trips to places you haven’t been before: the videos people post from their trips really show you a new country. Not to mention what the cheap hotel rooms really look like. I use guidebooks less and less these days. I prefer off-beat or quirky guides, like the Natural Guide to Bali, or the Little Book Room series, with their guide to Paris flea markets and others. Can you really experience another culture just by traveling there? No. I think everyone should study a second language and go live in other countries (particularly poor countries) for extended periods of time, especially Americans. A good way to do this is as a volunteer. There is nothing like being forced to embrace another culture to survive. It humbles you and expands your boundaries and makes you grow as a person. Volunteerism is a great way to spread ‘soft diplomacy’ and goes much farther to raise the reputations of Americans in the world than anything else I can think of. Travel is like oxytocin, the “love drug” of birth (see my Best Women’s Travel Writing story, “Bali Birth,” for more details about that). It reduces fear and increases trust.